Artists who seek to portray the Annunciation face many challenges: how to translate dense, revelatory words into visual terms; what to put into the piece of art, given the sparseness of the gospel text which says almost nothing about place and time; how to compress into one still image a sequence of events that must evoke Gabriel’s arrival, the conversation with the Virgin Mary, her fiat, and the angel’s departure. The image should seek above all to convey an event that far transcends our human capacity to portray or understand fully: the mystery of the eternal God breaking definitively into human history, spirit becoming matter and changing the meaning of the world. Luke’s few verses tell us much about the why, but less about the how of the Annunciation. But pious imagination always wanted to know more. From the 2nd century onwards, the mother of Jesus became an object of curiosity as well as veneration. The Protoevangelium of James quarries Matthew and Luke as well as many Old Testament passages to give an account of Mary’s birth and childhood, her betrothal to Joseph and the events of Jesus’s conception and birth. Despite never having been accepted as being canonical, inspired scripture, this fascinating 2nd century apocryphal account is the source of much Marian lore, including the names of her parents and the feast of the Presentation of the Blessed Virgin Mary. What do we know of the Virgin before the Annunciation? What was Mary doing at the moment of the angel’s arrival? Where Luke is silent, the Protoevangelium obligingly steps in with much detail to relate that she was dedicated to the Temple as an infant, spending her miraculous childhood in the Holy of Holies, fed by angels as she waited to become the New Ark of the Covenant and the place of God’s glory. The Protoevangelium goes on to tell how at the age of 12, Mary left the Temple and was betrothed to Joseph, and was chosen to spin the purple and scarlet thread for the new Temple veil: purple, that rarest, most expensive colour, foreshadowed the kingship of Jesus; and red, the colour of blood and humanity. 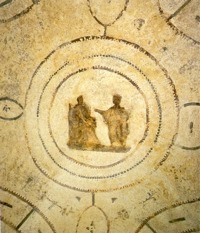 Standing in contrast to the imaginative details of the apocryphal account, the earliest image of the Annunciation, found in the 2nd century Roman Catacomb of Priscilla, reflects Luke’s terse description: before a seated and bareheaded Virgin stands a wingless angel, his hand raised to signify speaking. From that basic form grew a rich and elaborate tradition of depiction that has perdured through the millennia. 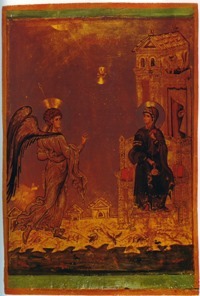 A 12th century Byzantine icon now in St Catherine’s Monastery, Sinai portrays what had by then become a traditional visual scheme. On the left Gabriel is portrayed as if he has just arrived, his torso twisted, his robe still fluttering in motion, one wing raised higher than the other. His movement is towards Mary, seated on a throne. Her head is alert, attentive: she is actively involved in listening to the message. The fact that she is seated on a throne communicates to the viewer that, in the words of the Eastern liturgical prayers of the feast, she is ‘higher than the cherubim.’ She holds the imperial purple yarn she has been spinning: her work will now be to become ‘the loom of the flesh of God,’ in the metaphor of St. Proclus of Constantinople (d. 447). If the gospel account tells us something about the Annunciation, it says nothing about how the Incarnation happened. From the late 2nd century, Christian thinkers began to conceive of the Annunciation and the Incarnation as one simultaneous event: in hearing the message of the angel and giving her fiat, the Virgin conceived Jesus. In the Sinai icon a diagonal beam of light comes down from the top left hand of the icon: its source is a partial circle of burnished gold, whose implied circumference lies outside the edges of the icon. This is the God which eye cannot see. What the eye quickly discovers, however, is a dove present in another circle, located half way along the ray – the Spirit descending. But very careful contemplation finally reveals something that is only really visible when one sees the icon at close hand: on the Virgin’s breast, in very faint grisaille is an outline of the Christ-child, surrounded by a circle which is at once Mary’s physical womb and the realm of the divine, and which touches the edge of the woolen thread. From his very conception, Jesus is God from God, and one like us in all things but sin. He is the ultimate revelation, the unveiling of the mystery of God and of humanity. Perceiving the mystery of the Incarnation requires patient contemplation and attention to detail. It is easy to miss the fact that in the Sinai icon, Mary’s left ear is partially uncovered. A series of Church Fathers expressed the conviction that Jesus, the Eternal Word, was conceived by Mary’s profound listening. St Augustine preached that the Virgin conceived by believing. The motif of ‘conception through the ear’ – bizarre to our modern sensibilities – was not, however, a quasi-obstetric explanation of the virginal conception. Rather it expresses a deep spiritual intuition about Mary’s capacity to hear God’s word wholly and unconditionally and let the Spirit quicken into a human life the one who is Life itself. See how Eve's ear inclines and hearkens to the voice of the deceiver when he hisses deceit to her. But come and see the Watcher, Gabriel, instilling salvation into Mary's ear and removing the insinuation of the serpent from her and consoling her . . . Instead of this virgin, Eve, another was chosen: truth was spoken to her in her ear from the Most High. By the door which death entered [i.e. the ear], by it too entered life and loosened the great bond which the evil one had bound there. Medieval Latin poetry and hymns frequently played on the conceit that the three letters of Eva (Eve) when reversed spell out Ave (Hail): the palindrome conveys the serendipitous truth that through Mary, death is turned into life, separation from God into intimacy with him. Reading the Old Testament through the words of the New is an integral part of Christian faith. But scripture was not the only place where artistic imagination found intimations of the Incarnation. Medieval and Renaissance artists inherited an apparently inexhaustible stock of symbols that found their way into images of the Annunciation and shaped devotion. The archangel and the Virgin – and sometimes the Spirit or God the Father – continued to be the main actors of their depictions. But they frequently moved the setting into very detailed interiors, including contemporary domestic settings. 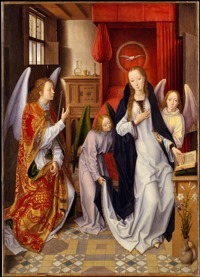 In the famous Annunciation that Hans Memling painted in about 1482, not only the demeanour of the Virgin and the Gabriel and the other angels, but also their clothing and the finely detailed furnishings of the room, conveyed important messages for those capable of discerning them. If there was an Annunciation, the painting implies, then multiple annunciations of God’s active presence surround us in the ordinary, the day-to-day in which we live: heaven and earth are full of God’s glory. Christ was born into this world, our time and our place. The artist portrays human life and homely warmth as transparent to the presence of God. Art history shows us that one significant change in the details of the portrayals of the Annunciation happened in the medieval west. Earlier art invariably shows Mary with a distaff, spinning the purple and red wool. However, from the 9th century onwards the Virgin begins to appear instead with a book, sometimes with her finger on the open page. How do we read this detail? St Ambrose, writing in about 377, had described the Virgin as ‘most studious in reading.’ The 8th-9th century Gospel of Pseudo-Matthew declared that the young Mary was ‘more learned in the wisdom of the law of God’ than all her companions. Reading requires solitude and silence. But it is also a form of companionship: Ambrose suggested that in pondering the words of the Old Testament, Mary found herself in the company of prophets and archangels. From the late 11th century, the reading Mary became the standard way of imagining the Annunciation. Medieval preachers, theologians, poets and artists had differing ideas about what precisely Mary was studying, with opinions that included the Psalms and the prophecies of Christ’s coming such as Numbers 24:17: ‘I see him, but not now; I behold him, but not near. A star will come out of Jacob; a scepter will rise out of Israel.’ But Ambrose’s opinion generally prevailed that the text was Isaiah 7:14: ‘Behold, a Virgin shall conceive in her womb and shall bear a Son.’ As Mary read, the ancient promises of the prophet, the hopes and fears of all the years, were fulfilled in her: the Word was to become the flesh and blood of the new and everlasting Covenant. Historical factors help explain how Mary’s book ended up as a central element in depictions of the Annunciation: the influence of key patristic writings, the rise of monasticism, the revival of learning that began during Charlemagne’s reign, the history of preaching, the growth of female religious life and literacy, and above all the spectacular burgeoning of Marian piety that transformed the landscape of Europe as well as its spirituality. But there is something more here than historical developments. The picturesque details of ancient Marian legends and the imaginings of the great masters of European art surely do not offer us a literal description of circumstances of the Incarnation. Instead, and more importantly, they seek to point our minds to its sensus plenior, that deeper level of meaning that only emerges in the spaces between intense listening and long pondering things in human hearts and the unpredictable workings of grace. As an event, the Annunciation has Mary at its centre. Hers is lectio divina in its fullest, most real sense. As mystery, the Annunciation extends out in time and place to embrace all Christians. Whether in hearing the words of God or reading them, Mary internalises them so intensely that they take flesh in her as the Word. At the beginning of the 12th century, the Benedictine Goscelin of Canterbury wrote to his spiritual daughter, an anchoress, encouraging her to take Mary as her model and understand Christ as coming into her soul as he came into the Virgin’s womb: ‘Conceive Christ, carry him, give birth to him, feed him. Let him deign to be born in you from his infancy and to grow in you to the fullness of love.’ Some fifty years later, the Cistercian Isaac of Stella taught his listeners that that in differing ways on differing levels, ‘every Christian is also a bride of God’s Word, a mother of Christ, his daughter and sister, at once virginal and fruitful. These words refer in general terms to the Church; they are specially true of Mary; and they also apply to individual Christians in particular ways.’ Each of us is called to discover our place in the mystery of the Annunciation, to know the Incarnation by the message of an angel, and to pray that by the mystery of his Cross and Passion, the Son of the Virgin may bring the whole world into the glory of the Resurrection. Dorian Llywelyn is a Welshman and a member of the California Province of the Society of Jesus. He is currently teaching systematic theology at Heythrop College, University of London, and superior of the Brixton Jesuit Community.